Menulog delivers for Wok In a Box - Gilles Plains so you'll be able to track your courier on a map. Cooked in coconut oil, our rice bowl with pork, kale and brown rice, tossed in soy sauce is packed with protein. Cooked in coconut oil. A delicious mix of chicken, broccoli, baby corn, edamame beans, spring onion, carrots, and onion tossed in fish sauce and served with white steamed rice. All of these dishes are served with noodles. If there is a chilli icon, that means the dish contains mild chilli or spice. Our dishes contain a mix of different fresh vegetables, including onion, carrot, capsicum, broccoli & bok choy. If you select Extra Meat, Chicken, Pork, or Seafood to be added to this dish this must be selected when placing your order, and extra items may incur an additional charge. Hokkien noodles with garlic prawns & mixed vegetables in our oyster sauce. All served with steamed rice. If there is a chilli icon, that means the dish contains mild chili or spice. Our dishes contain a mix of different fresh vegetables, including onion, carrot, capsicum, broccoli & bok choy. If you select Extra Meat, Chicken, Pork, or Seafood to be added to this dish this must be selected when placing your order, and extra items may incur an additional charge. If there is a chilli icon, that means the dish contains mild chili or spice. Our dishes contain a mix of different fresh vegetables, including onion, carrot, capsicum, broccoli & bok choy. If you select Extra Meat, Chicken, Pork, or Seafood to be added to this dish this must be selected when placing your order, and extra items may incur an additional charge. Our favourite Bento boxes are the complete meal! You can add extra Katsu chicken for only $5. 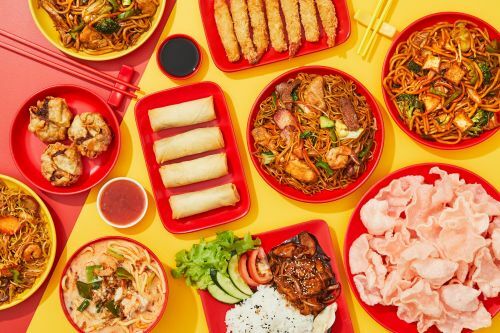 Meals for the littlest Wok lovers! All of our Junior meals come with a fortune cookie and drink. Thin egg noodles, beef, carrot & broccoli in our honey soy sauce. More of what you like, and less of what you don’t! Create your own dish, and add what you want. Make it just the way you like it.